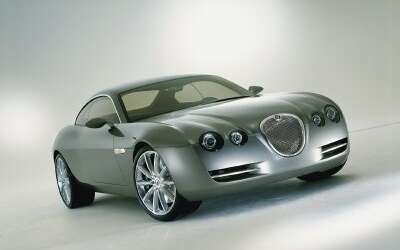 Jaguar R-Coupe Concept Debuts at Frankfurt and signals New Design Philosophy. Jaguar takes a leap into the future with the public debut of a new concept car at the IAA (Frankfurt Motor Show) on September 11, 2001. Conceived to demonstrate how the companys design philosophy may develop in coming years, the Jaguar R-Coupe is a prestigious and sensuous four-seater coupe that reinterprets Jaguars core design values in a fresh and forward-thinking way. The proportions and stance of classic Jaguars from the 1950s and 1960s inspired the powerful look of the R-Coupe, where strong, geometric forms underpin the cars flowing lines. Exterior detail is restrained but picks up characteristic Jaguar design cues, such as the front grille. The cars warm and rich interior puts a contemporary twist on the use of wood and leather, to create a luxurious environment influenced by the latest trends in furniture and interior design. Wood veneer sweeps right round the cabin, leather covers the floor as well as the seats, and many jewel-like details are silver-plated. The R-Coupe is not intended for production, but it embodies themes and ideas that may find their way into future Jaguars. The concept is not based on any current or proposed Jaguar chassis, though it is constructed around a realistic four-seater package and a V8 powertrain. Further examples of advanced technology incorporated into the cars design include F1-style paddle shift gear-changing, headlight beams that follow steering direction, electronic door releases and a futuristic, voice-controlled telematics system. The R-Coupe is the first complete vehicle developed since Ian Callum was appointed as Jaguars new Design Director in 1999. One of his earliest moves was to introduce a 15-strong Advanced Design studio, headed by Julian Thomson, which has taken the lead role in bringing the R-Coupe to life, working with Callum to develop Jaguars new design philosophy and design language. A prestige, four-seater performance coupe was chosen to embody the new design thinking because such a model does not figure in Jaguars future vehicle plans. So the R-Coupe can be shown in public without revealing hints of any specific vehicles in the pipeline. Jaguar is currently undergoing a product-led transformation that is seeing its line-up grow from two models in 1998 to four today, and to five with the launch of the F-TYPE in around three years time. The Advanced Design team originally produced six exterior proposals for the R-Coupe, as scale models. A design from Julian Thomson was selected as the basis for the finished vehicle, though incorporating details from the other proposals. Lead designer on developing the exterior was Matthew Beaven. The interior design was chosen from a series of sketch proposals, with the one selected being by Mark Phillips, who became lead interior designer for the project. The design of the Jaguar R-Coupe was finalised early in 2001, and the team held regular reviews throughout the development process with Ian Callum.